Artist’s book: laserprint, hand-carved rubber stamp, wire, silk ribbon, Japanese-style binding. 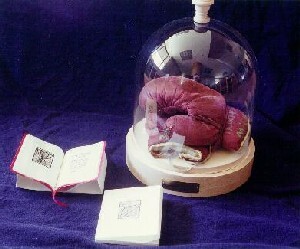 Reliquary: glass bell, lathed wood, engraved brass plaque, vintage boxing gloves. The idea for Holy Raiment grew out of an advanced fiber arts class wherein I set myself the task of combining my bookmaking skills with cloth. Returning to a religious theme (my parochial schooling has served me well), I decided to craft a book of saints that would act as a reference to a series of vintage garments conceived and displayed as sacred relics. Starting with a general index listing of each saint’s special patronage and feast day (we Catholics have a saint for everything and everyday), I chose those I could “define” with an item of clothing, e.g., Cecilia, patron of singers, shown as the beaded gloves of a chanteuse. The selection included saints both familiar and new to me, as with Lydwina, the patron of ice-skaters. Having had hernia surgery several years ago, I had to include Gummar who’s invoked against such a malady! The feast days yielded each saint’s history. I read various accounts and finally condensed these into a concise one-line narrative. The intimate size and shape of the reference intentionally recalls a prayer book, complete with silk ribbon marker. The hand carved imagery opposite the corresponding text serves as the identifying attribute, in keeping with the practice of representing each saint with a specific symbol or emblem. Researched and studied, this attention to details reinforced the religious theme. Shopping antique and vintage clothing stores balanced out the whole creative process. I made a serendipitous find in the boxing gloves. The previous owner had painted his name of Mike on each cuff. As I was driving home, I realized they could be used for Saint Michael the Archangel, even though he was not in my original selection. I promptly turned around and bought them, just the same. Reworking my layout was minor to include such a godsend as these!